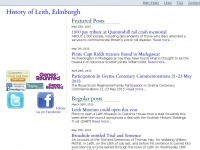 Leith History is specified as the websites creator. Copyright (c) 2010 by John arthur is the owner of the copyright for this website. 6. 1000 pay tribu­te at Quin­tinshill rail crash memo­rial /2015/05/25/1000-pay-tribu­te-at-quin­tinshill-rail-crash-..
7. Pira­te Capt Kidds treasu­re found in Mada­gas­car /2015/05/07/pirate-capt-kidds-treasu­re-found-in-mada­gasc..